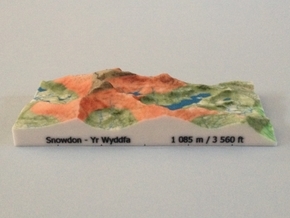 The product is a full colour, hollow 3D terrain model of Snowdon (highest mountain and the modeller's favourite in England and Wales) based on Ordnance Survey elevation data draped with an Ordnance Survey 1:50,000 map image. It is an ideal gift for a mountain walker, mountain lover or a map enthusiast, or an attractive souvenir for anyone who has visited the summit of Snowdon on foot or by train and has admired the shapeliness of the mountain and its neighbouring peaks. The model can be put on display as an eye-catching ornament or memento that will be sure to be a conversation piece. 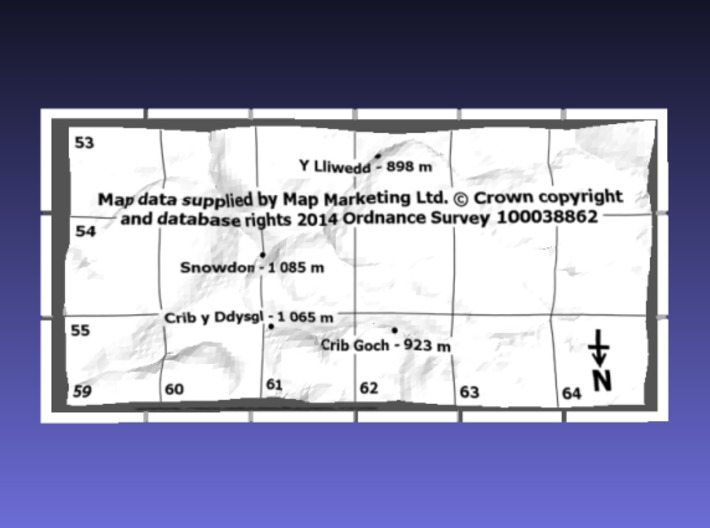 It could also be a useful tool for a geography teacher or navigation instructor who wants to demonstrate how 3D terrain relates to its representation on maps. 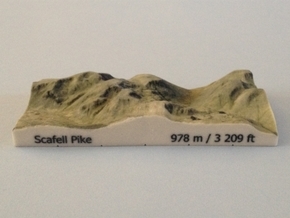 The vertical scale of the model has not been exaggerated and the model is therefore is completely accurate to scale. 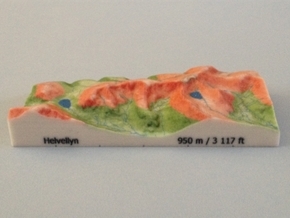 The 3D model is aligned to the UK National Grid with the 1 km grid lines etched on the bottom of the walls of the model. 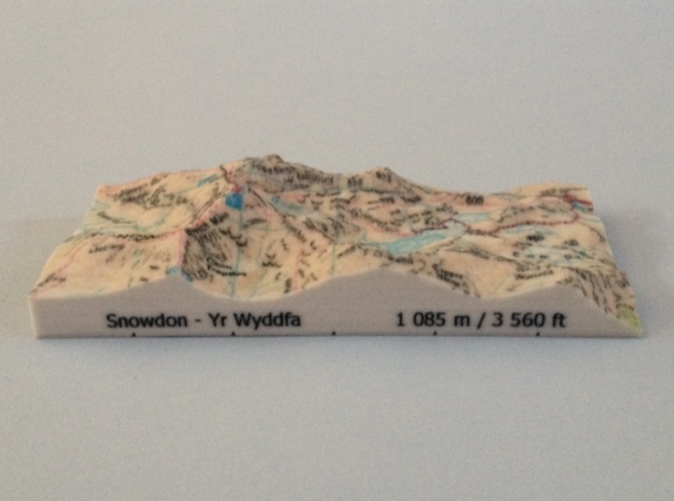 In addition to Snowdon, the model also features Crib y Ddysgl, Crib Goch and Y Lliwedd (the peaks on the famous Snowdon Horseshoe ridge walk). West wall: the branding "Mountain Shapes"
Material: Full Color Sandstone - a hard brittle plaster-like material with a granular look and feel. 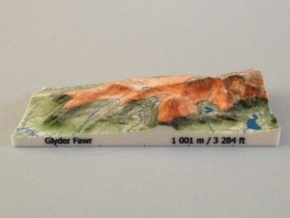 The model could be damaged if dropped onto a hard surface, knocked by a hard object, exposed to water, heat or strong sunlight for prolonged periods. 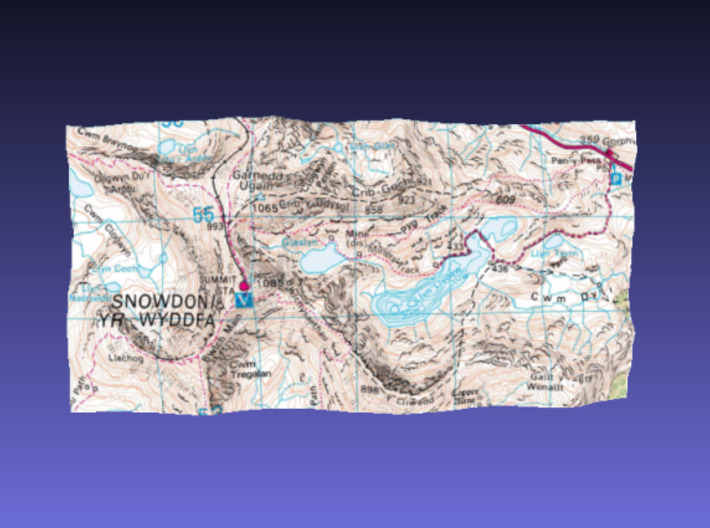 A legend for the Ordnance Survey 1:50,000 map can be obtained by downloading the Ordnance Survey 1:50000 Colour Raster Legend.